Which Photo Sharing Site is for You? Facebook recently purchased Instagram for a billion dollars. This got a lot of people concerned (including myself) that the very popular social photo sharing site will be transformed or ruined by the acquisition in some way or another. Many people turned to the web to find another photo sharing site. In case you are curious what other options are out there, here are 3 sites I am currently using. This site was founded and run by a local team here in Toronto. It has some fantastic features that also include social media. The user interface is beautifully organized and easy to use. This is a site dedicated to the professional. This is where you would upload your portfolio, or some of your best stills. Once uploaded you can easily share to Facebook and Twitter or even embed your photos to where you need. 500px also allows you to interact with other photographers by following them and commenting on their photos, and they can in turn follow you back. If you are worried about people stealing your pictures, 500px also disables the right click on the photos. This is a very community based site. Perfect for anyone looking for a community experience. This site provides you with a limited 14 day trail period, but also has some great features. SmugMug has very similar features and also allows you to upload videos. They also provide additional security with the ability to password protect your albums , and they back up your RAW files across multiple servers so you will never loose a photo. SmugMug also offers you a personalized store, URL, and logo. 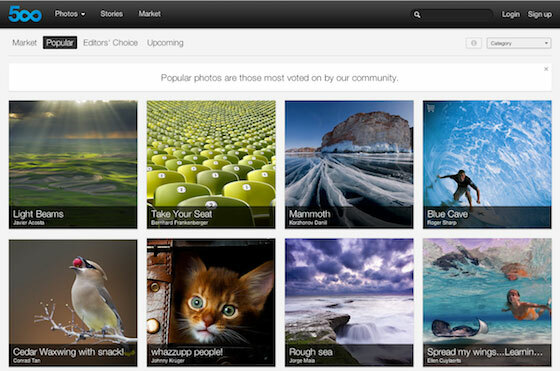 However they do lack the community feel that 500px provides. SmugMug is also priced higher than it’s competitors. Since there really is no free account, a Basic account will run you $40 per year. For more powerful features you will have to jump into a Power or a Pro account that will run you $60 and $150 per year. It seems their user base is mainly designed for people who want to sell their photos. This site is perfect for the novice. The User interface is very simple, and provides you with plenty of features, but it’s not the prettiest. It’s free account allows you to upload whatever you need, and share almost anywhere you want. The free account provides you with 10GB of bandwidth per month, not to be confused with hard drive space. Photobucket also allows you to password lock your albums. If you need more bandwidth than a Pro account is what you are looking for. The Pro account will provide you with unlimited bandwidth with no ads and the ability to store photos. The site also allows you to upload videos as well. The community is very much a wide variety of users from novice to pro. Now which one is for you? Well I can tell you after using the 3 of these sites they definitely all have their pros and cons. If you a re looking for a community based feel with professionals, and clean looking user interface than look no further than 500px. If you are a professional looking to sell your photos, then SumgMug’s plethora of options is the ticket. But if you need to share family photos or a novice just staring out than Photobucket is a clear winner. If you simply can not choose, then why not just try them all out. All 3 of them have some kind of free account or trial period. Which photo sharing site do you like to use? Tell me which one and why? I would love to know. Ultra style. Ultra performance. Ultrabook. Learn how Ultrabook is changing the face of everyday computing Intel Canada’s Facebook page.